The chapter explores the material spaces and logics of religious learning processes. A discrepancy between religious educators and the 14-year- old confirmands was evident during a year of ethnographic fieldwork. A material semiotic approach provides important perspectives on the dynamics between material and human actors in religious learning context. The findings suggest that different notions of space with different logics of religious learning were established during the confirmation program. The spaces and logics were constituted by the interplay with material objects, pastors, catechists, and confirmands. The chapter points to how materiality is part of religious learning and how materiality can open up different ways of practicing and conceptualizing religion. The aim of this paper is to explore the spaces for confirmands’ learning processes with the analytical lens of material semiotics and actor-network theory (ANT). In this paper, I use ANT perspectives on a religious educational practice; confirmation within the Lutheran Church of Norway. Confirmation stems from an era of stern religious rule where Lutheran Christianity was the only religion approved by the King. When introduced in Norway in 1736, confirmation was compulsory for every citizen until 1911. Although confirmation was a forced practice, it had a large impact on the Norwegian society. Through confirmation, ordinary people learnt to read and confirmation became a rite of passage into adulthood (Salomonsen, 2007). Today confirmation is a voluntary 8 month religious educational program. The confirmation day is celebrated with a large family feast. Salomonsen argues that this family feast is unique in a Scandinavian context and one of the reasons of the prevailing popularity of confirmation (Salomonsen, 2007, p. 169). The Norwegian Folk Church has a large membership (77% of the Norwegian society) but low participation (3% at Sunday services) (Church of Norway, 2014). However, approximately 67% of Norwegian 14-year-olds participate in the religious practice of confirmation (Schweitzer, Ilg, & Simojoki, 2010, p. 165). In Norwegian confirmation, old traditions from a homogeneous religious society meet a complex, plural, late modernity. This places confirmation at an intersection inhabited by experienced religious “insiders” and newcomers who share and explore the same practice of religious learning. During 1 year of ethnographic fieldwork with three confirmation programs in Norway, a discrepancy between the religious educators and the confirmands was clear. Though they shared physical space, the different actors appeared to belong to different worlds. This study suggests that the interplay between confirmands, religious educators, and the material environment establishes different notions of space. As stated by Fenwick and Edwards there are relatively few ANT analyses of educational practices but that ANT has a potential in analyzing processes that are often unmentioned (Fenwick, Edwards, & Sawchuk, 2011, p. ix). However, there is a growing strand of research using ANT perspectives in order to better grasp the complexities of educational practices. Within literacy research, Mills (2016) endorse the usage of ANT concepts. She argues that ANT could help to transform literacy research from a sole focus on the teacher to more collective focus on these complex practices (Mills, 2016, p. 120). In this paper, I explore how these spaces are categorized by different logics for religious learning and how they constitute religion as a whole. 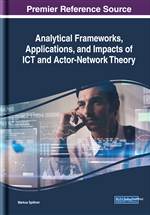 This empirical study was based on the material semiotic traditions of actor-network theory (ANT), science and technology studies (STS), and socio-material theories in educational research (Fenwick et al., 2011; Latour, 2005; Law, 2007; Law & Mol, 2002; Sørensen, 2009). The paper also draws on recent contributions to the materiality of religion (McGuire, 2008; Vásquez, 2011; Woodhead, 2011). The most significant contribution within religious studies ANT or socio-material comes from Cadge (Cadge et al., 2011) and Bender (Bender et al., 2013).